Shell casings were found in an alley behind this building at Diversey and Orchard, police said. A gunman opened fire during an apparent drug transaction Sunday afternoon in Southeast Lakeview, according to police and department sources. No one was injured in the incident, but two windows were shot out in a nearby condo building. A suspect is in custody and a handgun has been recovered. Witnesses reported hearing eight to ten shots fired in the 2800 block of North Clark and the 2800 block of North Orchard just before 3 p.m. today. Police found shell casings in an alley behind the Half Shell restaurant across from the usually-bustling Trader Joe's. At least one person reported seeing two men engaged in what appeared to be a drug transaction with a third man in or near the alley, a source said. At some point, the third man pulled out a weapon and fired repeatedly. No one has come forward to complain about being shot at or robbed. About 20 minutes after the shooting, a resident reported seeing a man hiding a gun in his clothing near the intersection of Clark and Orchard. Police responded, found a handgun, and arrested the man. 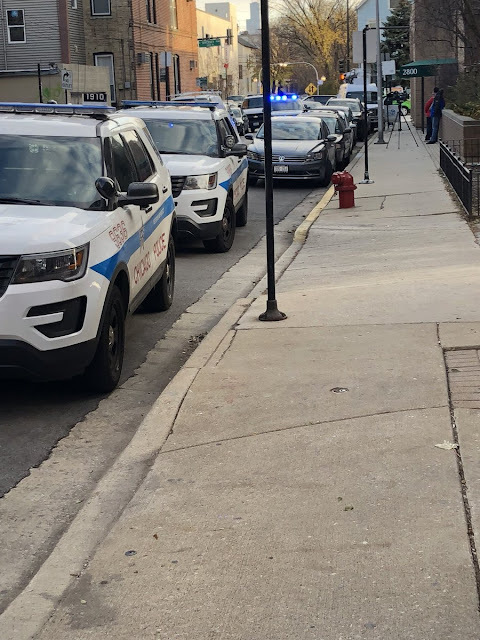 Meanwhile, two residents of the 2800 North Orchard condo building reported having windows shot out in the incident—one on the sixth floor and the other on the eighth floor. No one in the building was injured, police said. Police tonight would only say that charges are pending. CWBChicago will update this story on Monday when charges are finalized. Charges are expected to be finalized by Tuesday morning. CWBChicago will publish an update then.